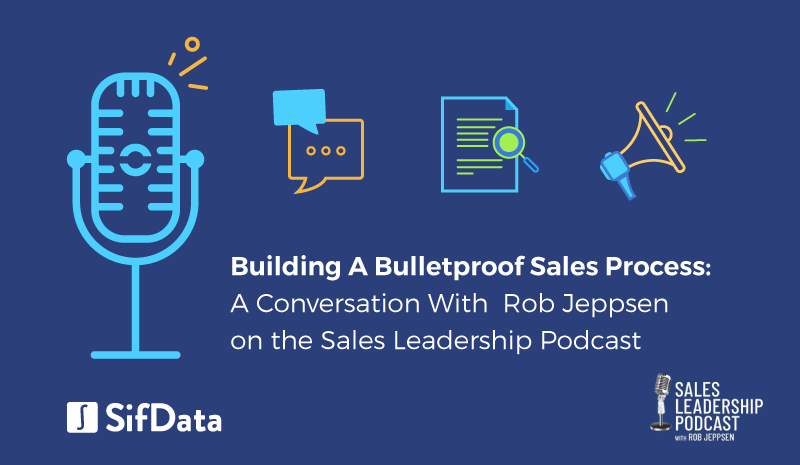 Kyle Morris, Ex Special Ops Army Ranger and Founder/CEO of SifData was recently invited onto the Sales Leadership Podcast hosted by Rob Jeppsen. Through Kyle’s experiences leading teams in the military and sales, he has collected some awesome insights about what it means to be a leader and what it means to grow individually. Together they discussed how SifData originated, Kyle’s military and sales growth experience, and a few blueprints that sales managers can utilize for sales and leadership success. Where did the idea for SifData come from? SifData is an application in Salesforce that tracks when contacts change jobs in order to reduce churn, generate pipeline, and close deals faster. The idea for SifData came to Kyle when he was an SDR and searched for ways to make setting up meetings easier. His “thing” as an SDR was to always reach out to customers as they were changing companies and that helped him to start to secure more meetings. After being faced with this problem, Kyle spent nights and weekends coming up with the idea for SifData and coding the Salesforce application. SifData has grown like crazy since then and there are a few reasons why…. After researching how often he should be sending emails to customers and what are the best times to reach out… Kyle discovered that one of the top sales triggers is executive turnover. After an executive moves into a new role, they are more likely to makes major tech changes and during this time they have the budget to spend on new technologies. This is exactly why, as an SDR, you need to keep track of when your key sales leads are moving to different roles with more power and more responsibilities. What’s harder? Getting into high-growth mode or staying in it? Kyle Morris believes that staying in high-growth mode is the most challenging aspect of a growing business. He compares Tom Brady and his ability to dominate the game of football for 20 years to being a leader in any industry. In the world of startups, getting the first round of capital investment is the easy part, but maintaining focus and motivation is the more difficult part. Rob: You’ve succeeded in the military, with small companies and big companies. What are your blueprints that lead to winning? Kyle: As you’re leading a team or starting a company it’s easy to focus on the small problems in front of you… like, ‘Squeaky wheel gets the grease’. But it’s very hard to take a step back and look at the broader picture. Kyle’s main tip is for leaders is to be comfortable delegating tasks that need to be dealt with now, so you as a leader can focus on the bigger picture of where you want the company to go. Rob: How do you know, what to delegate, how to delegate more effectively, and what tasks do you choose to hold onto? Kyle: An application of this that I was taught in the military is that you can delegate authority, but never responsibility. I can delegate to you the power to get something done, but I can’t delegate to you the responsibility if it succeeds. That’s always in the leader’s hands. Commander’s intent is identifying what you want to accomplish as a leader and trusting your soldiers to get it done. Inform your team of your “commander’s” intent and let it be a guiding star of what you want them to accomplish and trust them to get it done. Rob: I’m fascinated by this idea of Commander’s Intent, any tips on how to pass off commander’s intent to colleagues? Kyle: It’s all about trusting the people that you’ve put in place to execute your intent as a leader. If you can’t trust those people to execute, then it’s your responsibility as a leader to hire someone else that can. If you’re in a position of leadership, your job is to develop your colleagues so that they can take over your responsibilities in the case it’s ever necessary. Through Kyle’s experiences leading sales growth teams and army squads, he has collected some awesome insights on how to be a better leader. Listen to the whole podcast episode to hear more of Kyle’s sales and leadership insights and check out SifData at sifdata.com or by downloading the app on Salesforce’s AppExchange to improve your sales processes. Date- March 8, 2019, 3:53 p.m.